MobiArc 200 amp DC welding machine. Leece Neville 200 amp DC alternator. Safety shutoff and system protection built in. Four (4) AC electrical outlets. Rubber tire for on and off road travel. 2 wheel drive or 4 wheel drive. 416 loader — 77 horsepower. 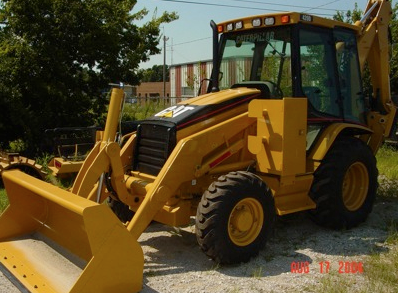 420 loader — 88 horsepower. Versatility and top quality performance. No surging during welding process. The right welder for every specification. Compact and rugged in one package. Built within the width of the standard machine.